Are you Team Sun or Team Moon? Pokemon Sun and Moon was on display during Nintendo's E3 2016 Treehouse event, along with some of the first gameplay we've had a chance to actually take in. A sizzle reel showing off starters Rowlet, Litten and Poplio had some screen time. Solgaleo and Lunala's impressive moves were shown off as well, truly decimating some Level 50 monsters. Professor Kukui, Lillie, and Hau were re-introduced as well. 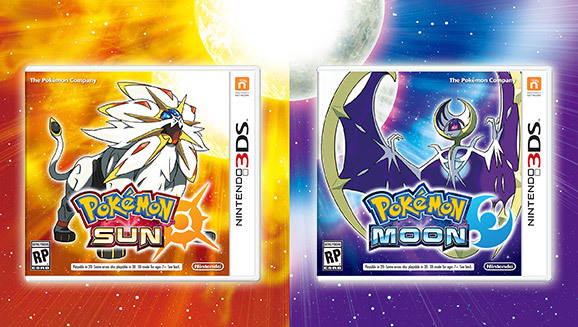 The legends say Solgaleo and Lunala are emissaries of the sun and the moon respectively and tie into the story in a unique way that hasn't been done before. As far as the meaning of the title Sun and Moon, the Sun is the source of all life on the planet, and it's the same on the Pokemon world. The moon affects our lives as well. They wanted to choose something "teeming with life" so ended up going with Sun and Moon for the name. Much of the stream was dedicated to information we've already heard before, like the news about Zygarde's changing forms, the Alola region. This just in: The starters are really cute, and that's on purpose. Rowlet says "Koo!" and Litten says "Mrowr," and Popplio says "Bwark," if anyone was curious. Though they really should be saying their names, if we're really going to be true to Pokemon lore, right? There was a chunk of gameplay shown off at the end of the talk, where the player character's different proportions (altered to look a bit more realistic) and the player's mom sends you off to head out on your own Pokemon adventure. The player has just moved to the Alola region in the footage shown and is heading to a neighboring town. There was a battle shown off with the player hanging out in the low grass, and interestingly enough a Ledyba appeared. The bottom screen still features all of the options for battle, but it's organized in a bit of a different manner. Interestingly enough, the trainer is shown at all times in battle on the top screen, with dynamic camera angles. An additional multiplayer mode called Battle Royal (yes, without the E) will allow larger-scale battles that take place in a coliseum of sorts. It looks like the game isn't going to be that much different than what we're used to, but there was a large chunk of gameplay shown off during the presentation. This post was originally published on Shacknews.